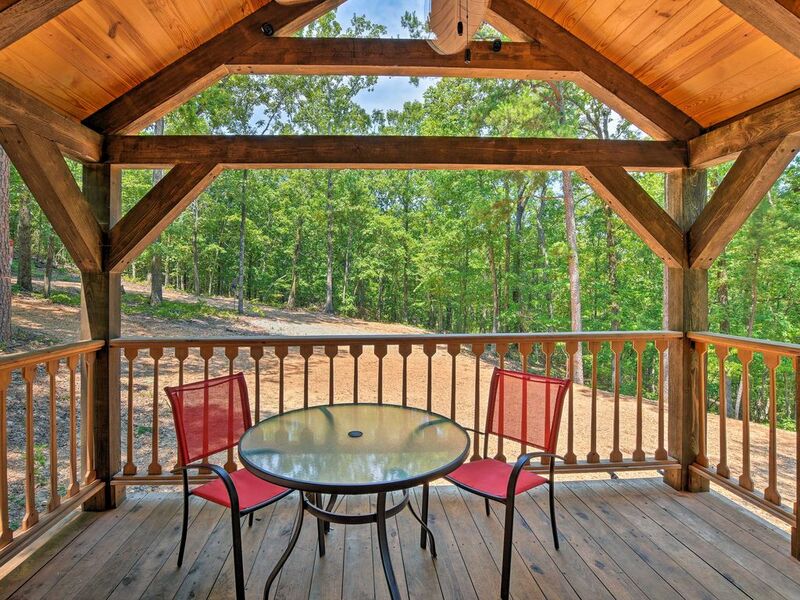 Get away from it all and spend some time reconnecting with nature during your stay at 'The Codex,' a 1-bedroom + loft, 1-bathroom vacation rental cabin in Murfreesboro, Arkansas! Eight guests and their furry friends will spend their days exploring the Arkansas wilderness and their evenings gathered around the fire pit making s'mores! Even though this home is tucked away in the woods, you'll be a short drive from everything Arkansas has to offer. With hardwood floors, wood walls and ceilings, and exposed wooden beams, this hand-made cabin provides each guest with a truly rustic feel! In addition to that classic rustic charm, 'The Codex' has all of the amenities you need for a perfect vacation. When you get back from a day of exploration, kick back on the futon and stream your favorite movies or shows on the flat-screen TV. Use the wireless internet access to search for fun things to do the next day! On pleasant evenings, step outside to the picnic area and use the charcoal grill to make a tasty barbecue dinner. Stick around after it gets dark and roast marshmallows by the fire pit. All 8 guests are bound to sleep well each night during your stay at 'The Codex.' You'll find a queen bed in the bedroom, a full-sized futon in the living room, and 2 twin mattresses plus a twin bed with twin trundle bed in the loft. Wake up in the morning feeling refreshed and cook yourself breakfast in the fully equipped kitchen. Make a cup of Joe and enjoy sipping your coffee out on the porch as you watch the sunrise over the treetops! 'The Codex' is ideally situated on the southeast side of Lake Greeson - away from it all, yet just a short drive from tons of outdoor activities for the whole family. During your stay, you'll be just minutes from some of the best fishing in the area at Lake Greeson and along the banks of the Little Missouri River, which feeds the lake. Rent a boat at Swaha Marina for a day of aquatic adventures. Canoeing and floating down the Caddo River is also a popular activity for those who love the water. When you're not in the mood to cook for yourself, head to The Dam Grill at the Swaha Marina for some fresh-caught fish and down-home cooking. Hunt for diamonds and keep what you find at the Crater of Diamonds State Park! This popular destination is less than 12 miles from the cabin. Travel an hour to Hot Springs National Park for hiking and unrivaled vistas! If you're seeking a thrill, rent an ATV and explore Bear Creek ATV/Cycle Trail which offers 31 miles of backwoods ATV trails. - Amenities include a fully equipped kitchen with stainless steel appliances, 2-burner cooktop and toaster oven/broiler, free WiFi, front porch with forest views, outdoor barbecue area with charcoal grill and picnic table, dog kennel, flat-screen TV with Roku, Jensen multimedia center with radio/CD/DVD player and Bluetooth capability, air conditioning, central heating, in-unit laundry machines, parking, and much more! - Secluded Murfreesboro location tucked away in the woods but just minutes from hiking, boating, diamond hunting, fishing, and much more! We lived the privacy and the woods we we're surrounded by. The cabin was very comfortable and cozy. We will be back! As a couple with a dog this house was good size. Never felt cramped even with the sketchy weather. It’s is one of the few places we just felt like sitting and doing nothing. The deck is great. I took my 16’ Jon boat and had a little issue with turning it around. Not much just a little tight, use the second entrance. There is a small boat ramp five minutes away at Parker Creek park. I used the marina which is 15 minutes away only because it was bigger. Overall Great, will return. Beautiful cabin that is very comfortable. Perfect relaxing vacation. Thank you!! Very clean, beautiful, relaxing. Vacation wasn’t long enough. Would love to come back again and stay longer. Beautiful property, lovely scenery very relaxing! !